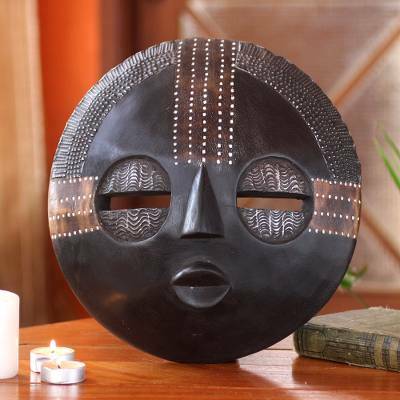 African wood mask, "Kokobene Luck"
Adorned with richly embossed aluminum, this elegant African mask is designed by Rita Addo Zakour. "The people of Kokobene in the central region of Ghana believe that if a man goes to the farm continuously during the week and meets a woman on his fourth day, this brings them luck. It its also a sign they will have a good harvest," she says. The rich beauty of aluminum repoussé enhances the mask. I was unprepared for how beautiful these masks are (Be Patient and Kokobene Luck). 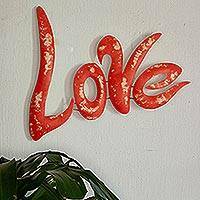 They were purchased to hang on a wall in the main living area and they bring a sense of joy to the space. They help tie together other high quality African art that is scattered around a very open area. I love my mask. I was hesitant in buying the mask from this site since it was my first time and didn't think it would be of great quality. But to my surprise, it was better than I expected. It is absolutely beautiful. I can't wait to hang it on my wall once I move. I loved this piece of art. It is everything I hoped for and expected. It feels and looks very well made and looks great on my wall. This, along with another mask, was the first item I bought/ordered here on Novica and all I can say is that I am a very satisfied customer. The mask is just as described but it is even more beautiful than the picture. Very pleased with my purchase. I am very happy with my KOKOBENE mask that i just got today!! I t looks great and I can't wait to hang it up in my home!! I will definitely be purchasing more work from Rita in the near future!! "Excellent Addition to our decor"